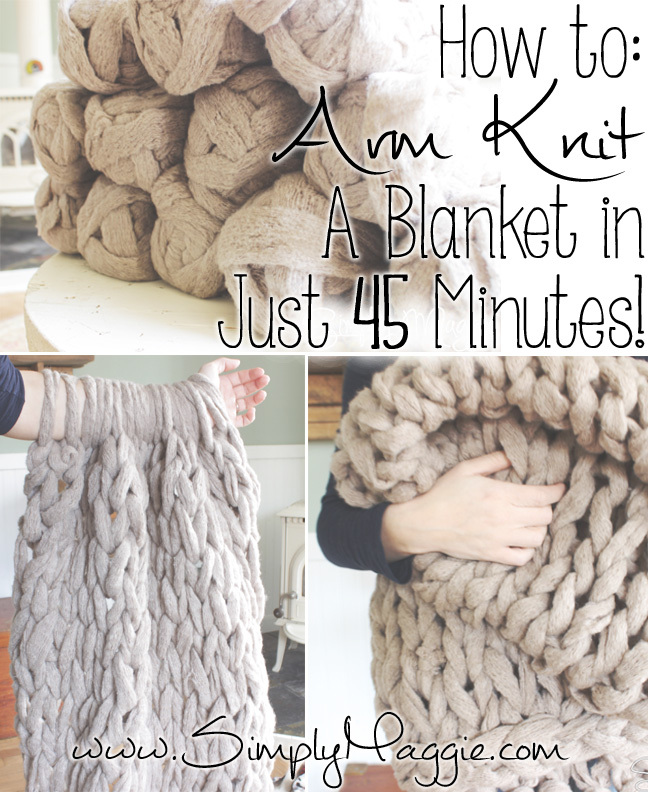 Knit a blanket in just 45 minutes using your arms as the needles! 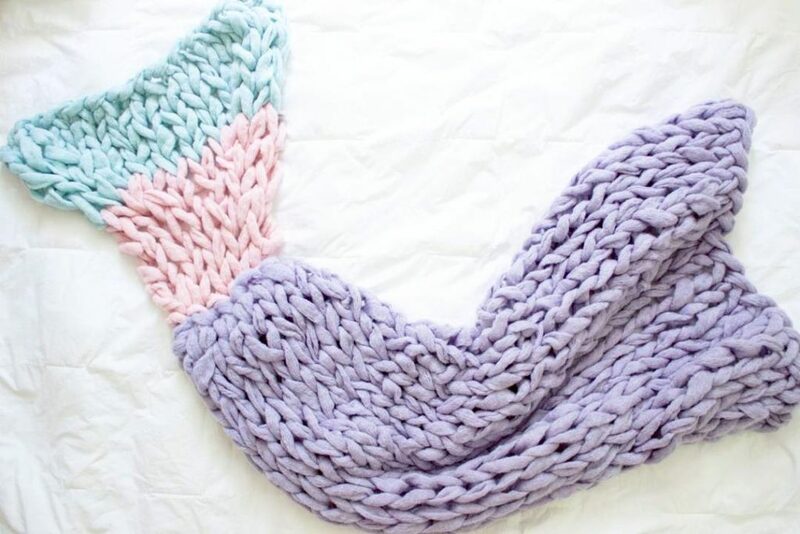 Arm Knit a Mermaid Tail Blanket! Find the tutorial here! 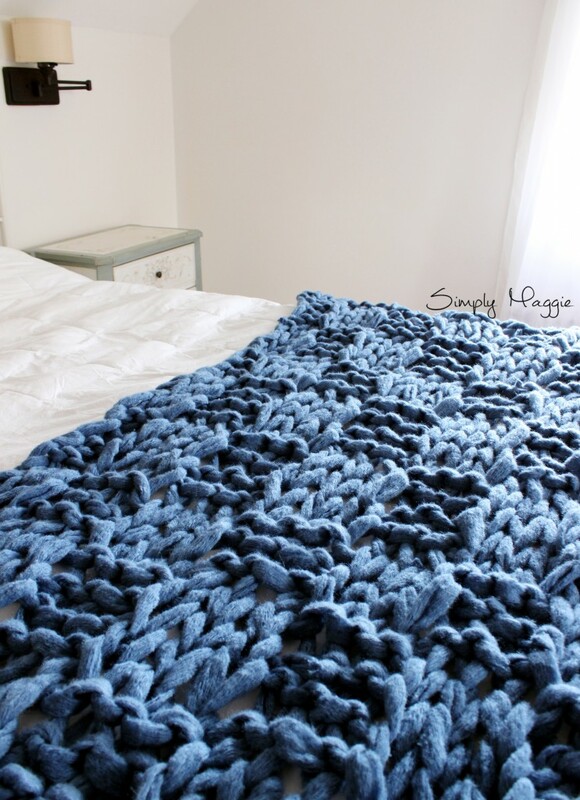 Arm knit a Basket Weave Stitch blanket like the one below by following this tutorial! How did this blanket turn out with the other yarn. I cant find any of the one she recommends! There’s a website called yarncanada.ca that sells a bunch of different kinds of chunky yarn! Their shipping is pretty well priced as well as their products. 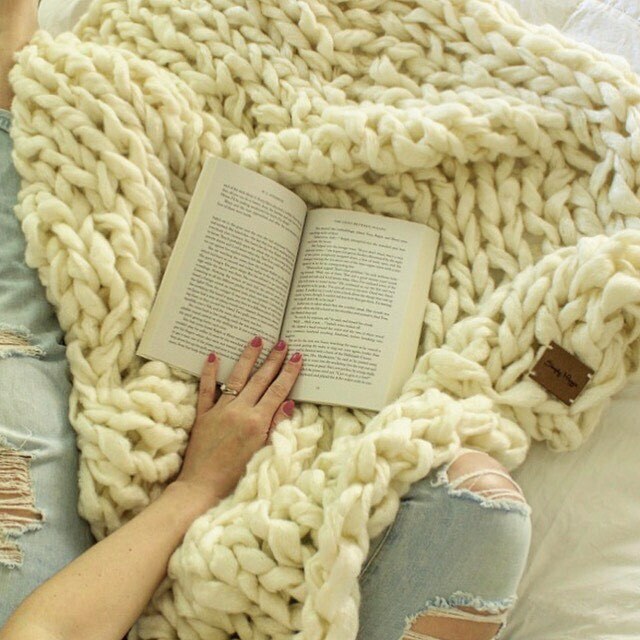 Have you made this blanket? How many balls did you need? Ebony, did you ever find the wool in Australia? I had to import mine. Would love to be able to purchase it here. If I did not want to use my arms, what are the largest needles I could use to get same look and size…someone even suggested pic piping…thanks, Maggie…ordering wool this week! Where can i buy it in Sydney Australia? ?? 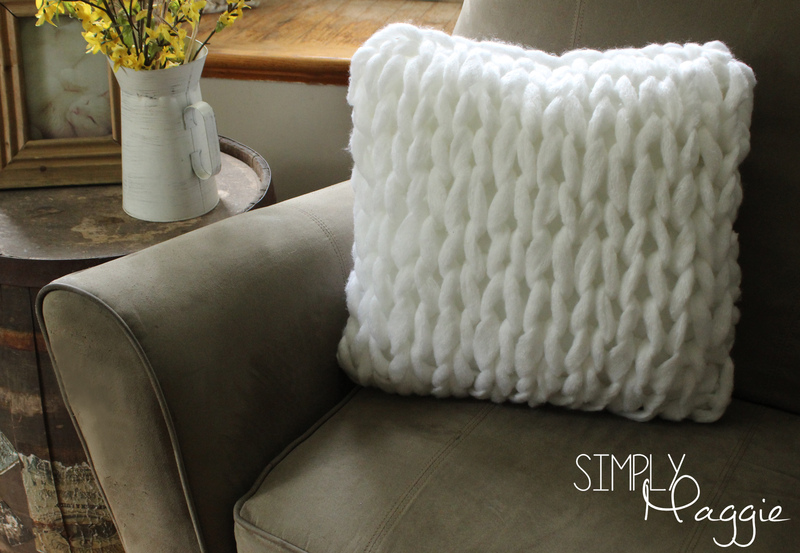 Did the yarn you used end up being just as chunky as pictured? If so, could I get the name of the brand from you? Thanks! Vicki – How did this turn out with you using the super bulky chenille yarn for weavors? I am always looking for the best bank for my buck that still gives me great results! Hello, I added links for purchasing online. I have hear that JoAnns carries it, also AC Moore will carry it at times but I had to order online. I also found the same yarn on stuff4.com and a lot of it was on sale for cheaper than anywhere else. I am wondering, I am in Australia and premier yarns online shop does not ship to Australia, I was wondering if you could send me a link of the same yarn but somewhere were it actually does ship to Australia. Like amazon but not so expensive. because i am bad at looking into things. I f you find a good place do you think that you will be able to reply with a link. I have a budget of $70-$100 (Australian) because that would be really appreciated. I was looking around your webpage at the yarns and I went in to premier yarns and selected the amount I wanted (11 balls of yarn), thank you so much mAGGIE BECAUSE i went to check out and it says country and australia is in there thank you very much Maggie even thought you didn’t have to do much!!!! I was looking around your webpage at the yarns and I went in to premier yarns and selected the amount I wanted (11 balls of yarn), thank you so much Maggie because i went to check out and it says country and Australia is in there thank you very much Maggie even thought you didn’t have to do much!!!! THANK YOU VERY MUCH!!!!! I AM SO HAPPY NOW because in a month it is back to the cold days. I bought 8 skeins of Lion Brand Quickie for $4.99/skein at Jo-Ann Fabrics online. It is 85g/22 yards per skein, so comparable to the 100g/16.5 yes of the yarn recommended. They’re both #6 super bulky. Lots of variegated color options for this Lion Brand Quickie! Hi- how did using the lion heart quickie yarn work out for you? Just looking into cheaper options! Did you leave the string, that wraps around the yarn, on? I wondered about removing it for more thickness..
Hey, this may be a dumb question, but I’ve never done any knitting before. Once you run out of the first skein, how to you start with the second one? Your video didn’t show you starting new balls of yarn, so I’m wondering if you can do the magic knot with all this stuff on your arms. I’ve already ordered my yarn. Can’t wait to do this! I don’t believe the magic knot would work with this method. I just do a normal knot. It should be in the video at some point. It was close to the beginning when you showed starting a new skein by tieing a knot. Just review her video close to the beginning. It’s in the video at 10:10 approx (might have to rewind about 30 secs. Also, how many stiches can you expect to realistically put on your arm with this specific yarn? Obviously, not everyone’s arms are the same length, but, you know. @ $18 a skein this is a $200 blanket! Yikes! I looked on Amazon and saw the three-packs, but a lot of reviews said that they still only received 1 skein and that the company was very shady about the whole situation. Are there any other brands similar to this yarn? No other brands but you can purchase from walmart.com. I ordered 4 packs of 3. And I received 3 packs of 3 and 1 individual skein. I went to call and it actually just had me enter my number for them to call me back. They called immediately and in about 3 minutes they had discovered the problem saw I was shorted 2 skeins and overnighted me the full pack of 3 skeins at no charge. So I ended up with an additional 1 skein. Not shady at all. Amazon was and is very professional and resolved the issue very QUICKLY. How many yards does 11 skeins end up being? I looked up Couture Jazz and it seems those bundles are 16 yards each, but that doesn’t seem like enough if you used 11. Each skein is 16.5 yards. I used 11 Skeins. Would it be any different of I used a different type of yarn? I have medium 4 worsted yarn already in the color I want.. would it just be smaller? It would be smaller and the holes would be much bigger. I’d use multiple skeins at once. 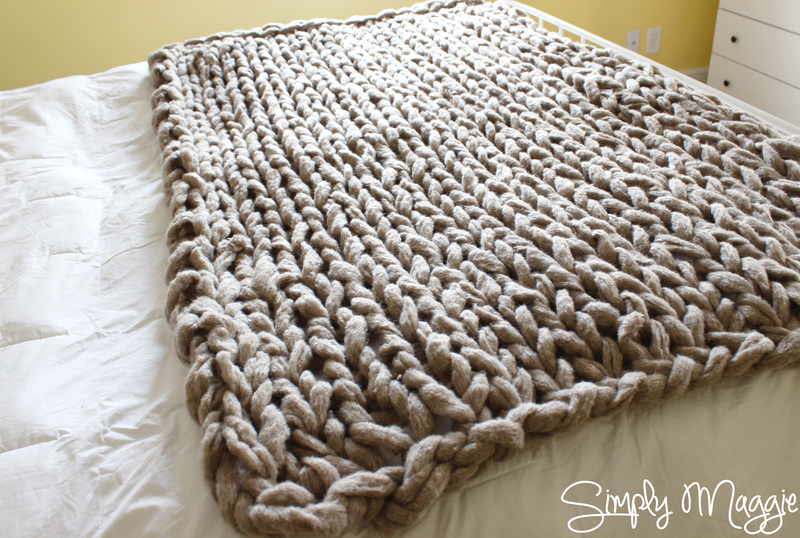 Say 3 strands of yarn together to get the bulky ness of this blanket. You would need to use about 12 strands of worsted weight to achieve the bulk of this yarn! I don’t have written instructions at the moment but you should be able to watch the video and still figure out the steps. Soon enough I’ll try to come out with an e-book with my patterns. 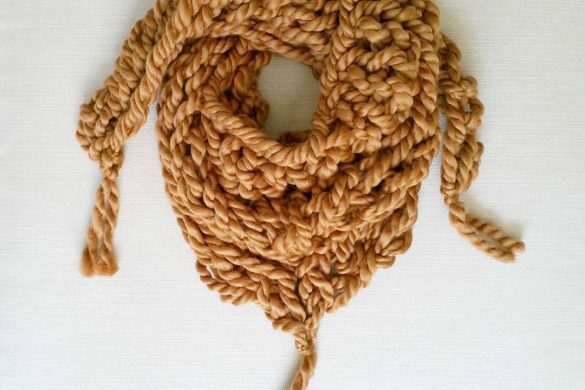 Do you think you could do this with t shirt yarn? Definitely. I’d use two strands at a time. 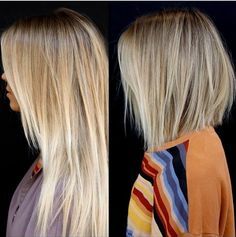 How do you use multiple strands at once? You use multiple skeins at once and then pull a strand from each skein. I just finished my blanket in white & black. bought yarn via Walmart as Maggie suggested @under $6 per Skein + free shipping. 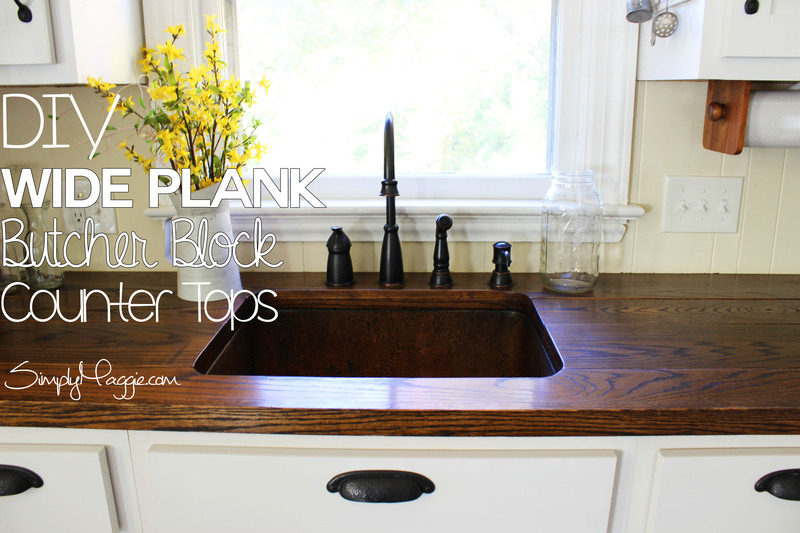 This went very fast and I love the easy instructions,detail and final look. Thanks for sharing Maggie. How did you do it with 2 colors? Whenever I got done with my first row, I had a done of loose yarn in the middle of the row. I tried again, this time making sure to keep the yarn tight after every stitch, and I still ended up with a lot of extra, loose yarn everywhere. Any advice? I’ve got my yarn and am super excited to start but I wanted a wider blanket! Would 12 skeins be enough for an extra 2 stitches but the same number of rows? Sounds like it would be enough. I just bought 12 skeins on the premier yarn website on sale for $2.50 each! They are currently on back order, but if you’re looking for a good deal and don’t mind waiting, it’s worth checking out! Well what was the site you got the yarn for at 2.50 each? I didn’t get them for 2.50 each. I got them for around 5.00 each at walmart.com. ACMoore had a sale on them so I bought a few there but they didn’t have enough for a blanket. I think she’s talking about the company that makes it, Premier Yarn. It looks like all these websites are either fully or almost out of stock, unfortunately. I’ll have to keep checking back so I can try it! Has anybody found any other yarn that’s as chunky as this one, by chance? I’m interested in trying this. I found some yarn I really liked, but it has a weight of 5, not 6. What effect will this have? Is it super bulky? If so it will work. Chunky will work as well. Hi I was just wondering I wanted to make a blanket using this method but I wanted to make it for a queen size bed. I saw that 18 stitches equals 3 ft so if I get a gaint stick and just add more stitches then that would work right? Or can I just make it as wide as I can on my arm and then maybe do another one and attach it to the first one? So make 2 blankets and just attach them like you did the scarf? Sure, either way should work. I wanted to make a queen sized version, too! How did making two and attaching them work out for you? I wonder if you could use a long pic pipe or a swim noodle toy? This is such a magnificent tutorial and idea!! I plan on making 3 of these for Christmas gifts this year!! Thanks so much! I don’t think I heard you say in the video…how long did this end up taking you? Literally just look at the title…. Can anyone tell me where to find number 6 super bulky yarn? Preferably online? Links are in my blog posts for all the yarn I use. Would Premier Yarns Deborah Norville Collection Hipster Yarn work because I saw it on the walmart website and it is only 3 dollars. The other stuff is like 7 unless you get white. It’s not anywhere near as thick so the blanket won’t be quite the same. It’s the first step so it’s at the beginning of the blanket. Using a different size 6 yard would work alright though? I have a bunch of lionbrand hometown U.S.A and thought if I did double or triple strands it might work without have holes that are too large? Lion Brand doesn’t have any yarn that is as thick but you could triple the strands and it would be close but not quite the same. This is a really informative tutorial! Thank you so much for sharing this. I think I’m going to try this out when it gets a little more chilly. Hey there, great tutorial! 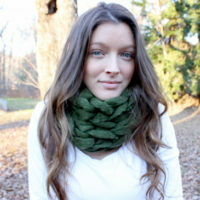 I was wondering if one could make a sort of chunky scarf using this method and just use fewer stitches for a smaller width? 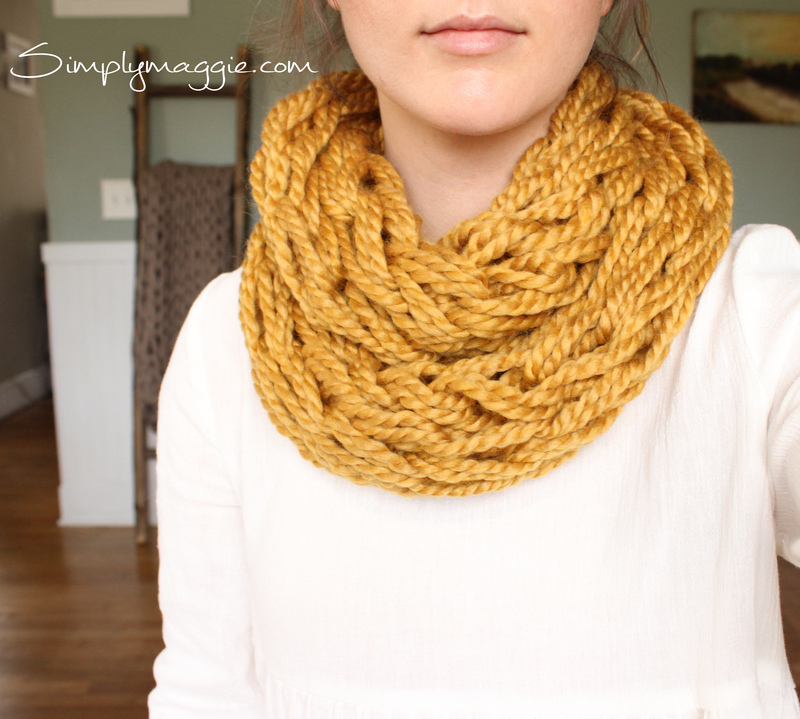 I know you make an infinity scarf like this but i would like to make just a regular scarf. Could this work? Sure. Try 4 stitches and arm knit until you have the desired length. I would buy 6 or so balls of yarn. I have used this method a few times for scarves. I have done both regular scarves and infinity. I used lions brand thick and quick. It’s a 6 and can be bought about anywhere. I can’t hear the instructions but trying to find out how many ‘things’ of yarn. I have never done anything like this but would like to try. so i have arm knitted a infinity scarf before and i was wondering how do u add the balls of yarn as you keep going or in other words how to you attach the balls of yarn once you run out? and where did you get ? I show in the video blanket video and in the 15 minute scarf video how to do this. Just tie a basic knot. Thank you Maggie. This looks like an exciting project. Now to try and track down this kind of yarn in the UK 🙂 Very good video. Thanks again. Did you have any luck? I too am from the UK and I can’t find anything of the like at a decent price. Any help would be much appreciated. 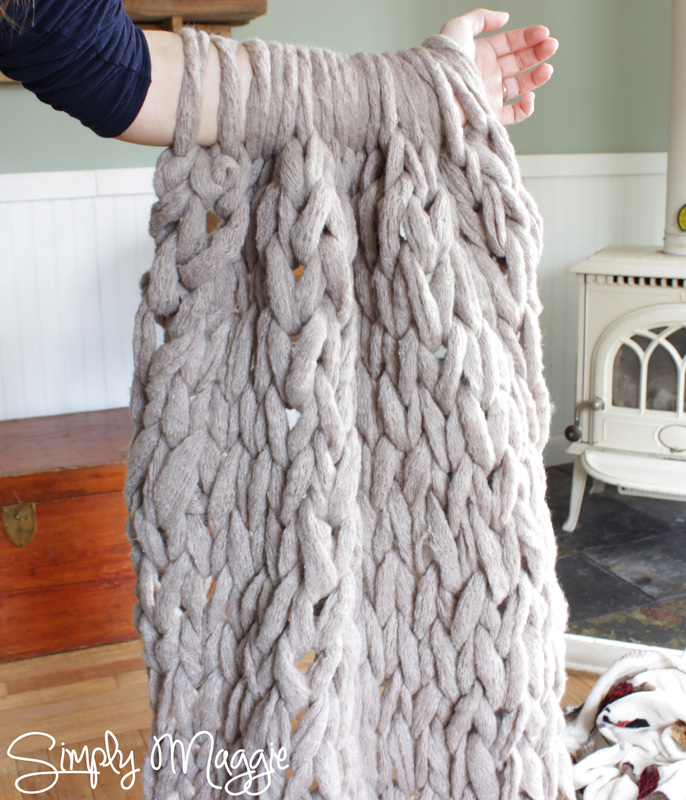 I see that you can add more loops on your arm for a wider (than 3 ft) blanket. Can you also somehow stitch two together? I’ve never done anything like this before and would like to try it. Sure. Try using the “sewing” method I do to sew the infinity scarf ends together. Hello. Have you ever used different colored skeins? If so how did they turn out? I haven’t. But others have and they look nice. This is a fantastic tutorial!! I’ve never knitted before and this seems like not a bad place to start. I do have a question though; if I wanted to make a 5×7 blanket about how many balls of yarn do you think that would take? Thanks so much! I would buy an extra 5 balls of yarn. So 16 total. Just out of curiousity, did the ends ever come out? Can you wash this blanket? I would hand wash and low tumble dry. No the ends never came out. hi Maggie! I LOVE LOVE LOVE this! I am using the bernat mega bulky 6 lb yarn. i have tried a few times and i keep ending up with a really long loop of yarn at the end of the row. i cant seem to not have that? i have tried to do it as tight as i can and so when i tighten it i end up with this loop and it gets bigger each time i tighen. am i doing something wrong or is it the yarn i am using? i thought of double or tripling my yarn? HELP!!! Hello! Definitely double or even triple your yarn if you are making a blanket. Though the yarn would be the problem, make sure you are turning the working yarn just as I do in the video. Follow the exact moves I do and it should work. I found I was casting on wrong. Frustrated me to no end. THEN I found this very short tutorial on casting on . I tried it … works like a dream! Maggie, I love your arm knitting tutorials and have made several of the infinity scarves for my granddaughters for Christmas! In response to Michelle, I had the same issue with the extra loop. I had my husband watch the video then watch me. He discovered I had the tail & working yarn reversed as I was casting on! (Sometimes an extra pair of eyes help!) Hope this helps you, good luck!! I saw your work on Pinterest and watched your video. I am in the process of making two other blankets for my twin granddaughters. However, once the holidays are over I am planning on this being my next project. Your video is very detailed so I’m sure I’ll be able to make one without any problems although everything I’ve always made has been crocheted. Also, if you don’t mind, could your please tell me about the song you have playing as background music? It’s a beautiful song. I would love to hear the full song and know who is singing. Thanks! Thank you so much for sharing this, it is so cool! Two quick questions. I wanted to make mine larger as well and I saw another commenter mention a scarf you did where you attached two pieces together, could you please link me to that video? Also, if I wanted to make stripes with two colors, how would I do that? Just change colors after every two or three rows? How much does the yarn cost? Can I get it at micheals craft store? I live in Canada and just purchased supper bulky #6 yarn in 100 yd skeins for 7.99 at Michaels! Great deal! I can’t seem to find the couture jazz yarn on any website that is in stock. I cany find it anywhere and inwas looking so forward to making the blanket I was really disapointed when I couldn’t find it. Can u help me out? I’m so excited to try arm knitting! I think this will be make great Christmas gifts. I’ve searched for the yarn you recommended (particularly in this gorgeous red) in your video all over, but I can’t seem to find anywhere that has enough in stock! Is there another brand of yarn you would recommend to use for arm knitting and for a blanket? I have been practicing with chunky yarn before I order what you used for your blanket. I can cast on stitches fine but when it comes to transferring them to the other arm it’s fine but when I get to the last one it is really loose. Seems like the tail makes the stitch loose. I am not sure why. any suggestions? Thanks. I would suggest to keep going to your next row. It may not be as loose as it looks if you keep going. How do you think a blanket would come out using Fat Russian roulette yarn from alpacas? I’m confused about the terms “working yarn” & “tail”. Which is which? Working yarn is the strand(s) attached to your ball or skein, tail is the shorter, loose end. Would using 1.5″ Rug braiding wool work for this? That is sold in feet, not skeins, so any idea on yardage for the amount of “yarn”? Tried all links above. I so want to try this…any suggestions are appreciated-or substitution yarn ideas? This blanket is fantastic and I’d love to make one but I can’t seem to find the couture jazz yarn anywhere (at least not in a colour that I’d like). Can you please let me know if there is another brand of yarn that would be similar and that I could substitute for the couture jazz yarn? I know you’ve wrote how long the blanket is but I’m used to cm. Do you know the size in cm? Looks like this yarn is only still available in baby pink. If anyone finds a similar brand, please share! Can this blanket be machine washed? Maggie! Your video is fabulous!! I have been searching high and low and no-one has this yarn in stock, including the websites you posted. I have yet to find anything quite as bulky or thick…. any ideas on substitutes? Thanks so much! I still can’t find any of the yarn that is used in this video, every where is out, any other suggestions?? Thanks! What other minds of yarn do you recommend for this project? None of the websites have the yarn in stock now. Walmart has only one color but has a limit on the number of skeins you can purchase. I know no other yarns are as thick, but can you recommend an alternative brand/style? I used a 6-wt yarn for an infinity scarf, and even double-stranded, it ended up being super holey. I’d appreciate any suggested yarns! Looking forward to hear from you! Thank you. WOW – thanks so much! This is one of the coolest things I have seen. Your video is excellent – very clear and easy to follow. I hope to make one of these very soon. Thanks again! Hi Maggie how many yard of yarn did it take to make this? I have tried searching for this yarn but it is all sold out is there another brand you would suggest? Is there a comparable yarn that is maybe more easily available than the Couture Jazz? I’ve tried all of those links and asked as various stores and none of them seem to have it. I really want to make this for a friend for Christmas but can’t find the yarn!! Is there a way to make this bigger? My fiance is 6’4″ and always complains that none of the blankets are big enough for him. Tough finding the yarn you used – although I am still looking. What yarns would be comparable? I’ve checked all the websites you listed and more, and the yarn isn’t available anywhere. Any substitutions or suggestions? I think this is the yarn ? The arm knitting yarn at Jo-ann’s does not look as thick as the one you use, do you know if it is as thick. The types are Bernat Mega Bulky Yarn, Lion Brand Quickie Yarn, and Red Heart Grande Yarn. Can you recommend another yarn in lieu of the couture jazz? It’s sold out EVERYWHERE and I would really like to try and make this blanket. If you head over to my FB page I have listed a couple of similar yarns. Yes, it’s the right yarn. If i want to make a blanket that’s for someone who is about 5’8″ how much yarn should I use and how many stitches should I make? If I want to make a blanket for someone who is 5’8″ how much yarn should i buy and how many stitches should i make? Buy 12-13 balls and cast on 20-22 stitches. is this the same yarn you used as the original scarf? So I’m attempting this blanket and cannot figure out why mine is so difficult. I must be making my loops a lot looser than you (only loose enough to move up arm) and at this rate I will only get about 24-26 rows out of 12 skeins. Help! The only advice I can give is keep the stitches as tight as possible. Maggie!! I love this blanket and want to make one like it, but I can’t find Premier Couture Jazz yarn anywhere. I see that it’s listed as a #6 Super Bulky, so I know there are other yarns with that same qualification, but I’ve never even seen that Premier yarn in person, so it’s hard to tell the gauge for sure. 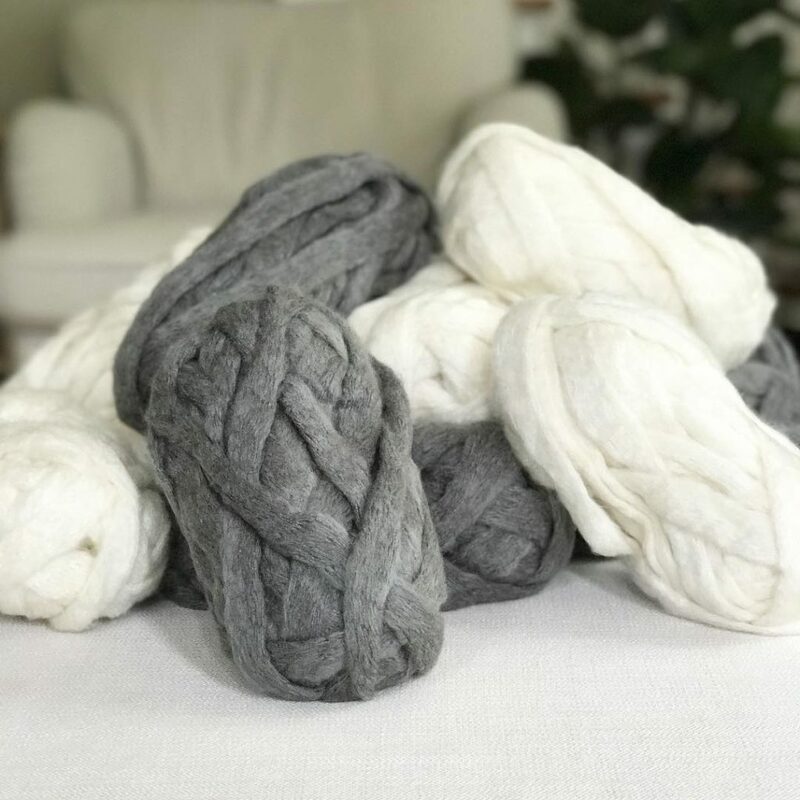 I like the look and feel of Bernat Blanket yarn, and it is also #6, but when I see it in person, it doesn’t look as thick as the yarn in your video. Do you think it would work? If I use yarn that is 6-Super Bulky will it have the same end result? I’m wanting to make one for my sister’s Christmas gift. Anyone who’s tried other yarns? Coutur Jazz is not in stock but they do have a starbella glam…. have you seen or worked with this yarn? if so would it work? It will be in stock middle of this month-end of the month. im making this blanket for my mom but I can’t figure out how to start the blanket! THANK YOU for making your video so detailed!! I always have such a hard time following the DIYs that I find on line because they don’t walk you through it step-by-step. This is perfect!! 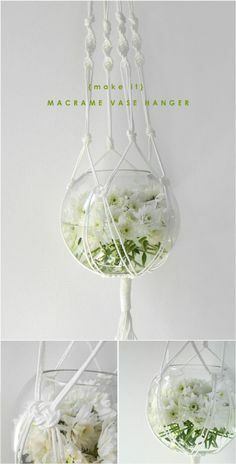 I’m going to make this for my mother in law but I am wanting to do 2 colors, how would I start it? When you run out of one ball, tie the next color on to the end of ball you ran out of. hi Maggie, this is a beautiful blanket. Thank you so much for sharing the video and the pattern. I have a question for you. Is the yarn soft? I am always worried about ordering yarn online I have never felt before lol thank you so much. I totally understand, I have issues with itchy yarn as well! It is very soft and not at all itchy or rough. I can’t seem to find this yarn anywhere…any suggestions on a different brand? Did you end up trying it? I’m thinking about trying with strips of fabric. 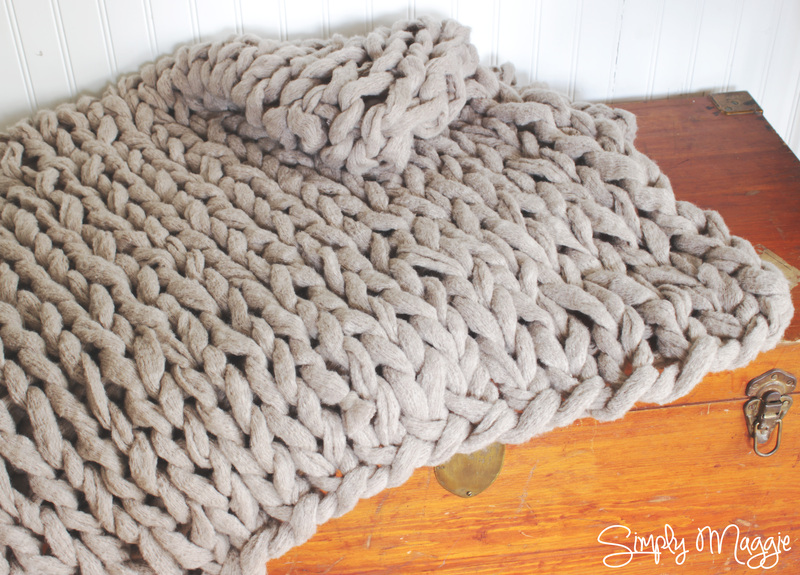 This “blanket” looks more like a rug to me, which got me thinking…if you make it with fabric strips instead of that super-chunky yarn, would this method work to make a rug? hmm…. Hi. Thank you so much for this video. I have my yarn (yay!) and sat down to get to work, but I am stuck already! During the video, you begin by casting on with the tail in the back and the working yarn in the front. (at the 4:54 mark, you point to the “tail” and it’s in the back of your wrist.) But, at the end of your casting on, the tail is somehow in the front. (at the 6:42 mark you take the back yarn and say it is the “working” yarn.) I knit all the time, and this is my first time arm knitting, and I have tried to figure out how you did that, and I am lost. I’ve cast on 3 times now, all 18 stitches, and my tail always stays in the back. I want so badly to make this awesome blanket for my children for the holidays, but I’m worried about messing up in the first few moments. Any help is so much appreciated! Thank you so much! Hello. No need to pay any attention to where the tail is after you have completed the cast on step. I am trying to arm knit a blanket and have some questions. When I do my first row of knitting, I end up with a fairly long piece of string from the original casting from trying to tighten the stitches. If I don’t tighten it though, the holes are pretty big. Can you help? Keep it tight. Having a tail left is normal. I made my blanket and LOVE it! I’m totally hooked! Hurray! (If anyone wants to see photos of the work, visit my instagram: michellegardella) Thank you so much for this video!!! Are there other yarns that are comparable and less expensive that can be use? I know that $5.99 isn’t a lot, but when you are buying multiple bundles, it can get pricey. 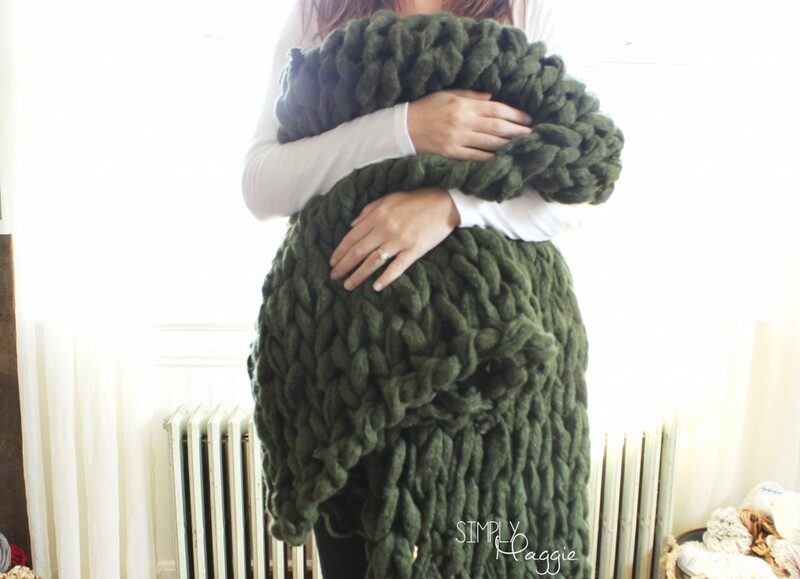 I love this arm knitting blanket idea and I want to make it for my twin sister and I’m very excited to do so! I just have a quick question for you. You said that the blanket came to 5 foot 3 foot and I was just wondering how I could make it bigger? Like, so I just add more rows? And since I want it bigger (like 5 foot 7 foot) how many balls of yarn should I get? 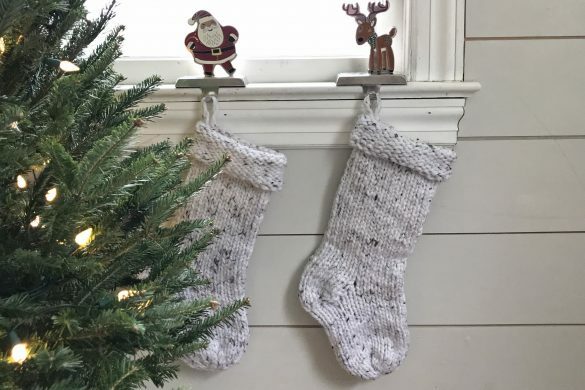 Is it possible to crotchet this same way? Then there would only be one stitch to worry about. i wondered the same thing, i think you can and i am going to try. will let you know if it works. right now i am arm knitting a covering for a decorative pillow – gives great texture and contrast, and am using fleece that i cut into 1 1?2″ strips. Funky and really cute. Would the #6 yarn from Loops and Thread work just as well as the Couture Jazz brand? It won’t be the same but if you triple the strands it will still look nice. I think your awesome I have always wanted to learn to knit and with doing it on your arm it was easy to learn. thank you! peace and joy. God Bless! This was my very first armknitting project and I absolutely loved it! I made a blanket for my grandmother and I am excited for her to unwrap it on Christmas Eve. Thank you for making this so easy and fun! I used Lion Brand Yarns, quickie, size 6. I made mine 20 stiches and 31 rows. This took 7 1/2 skeins. I love these but I still cant find the yarn . They are all sold out. I have made the scarfs and love them. Great gifts ! thanks for sharing . They have restocked a ton of new colors on their website. How many skeins should you get if you are using lion brand quickie yarn if you are 5′? Also does the lion brand quickie yarn work the same? Please advise. Love to start arm knitting, but I cannot find this type of yarn in the Netherlands where I live. Do you know where I can order it with international shipping? Where do you buy your yarn? I was looking online and that type of yarn you used was $9.99 each and you used a lot. Is there a way to get that much yarn without spending a lot of money? Just ran across this arm knit blanket. I’m a beginner and a little technically challenged. First question: in searching for the Premier Couture Jazz #6 weight yarn….not all #6 weight yarn is the thickness of the Couture Jazz yarn…right? Second, you say you list links of other places this yarn can be found….Where?? I’m not seeing them. Right. And premieryarns.com is the only website that sells it at this time. I cast 6 stitches then my tail is gone. What am I doing wrong? I did the 5 ft tail like you said but it just gets smaller and smaller as I go on. It is supposed to get smaller. Hi Maggie, that for sharing this. I would love to make this! I will see what yarns we have here in Australia that would be suitable. I’d like a soft yarn in navy blue. Hi Sally, what yarn did you end up purchasing in Australia and from where? Can anyone recommend a different yarn? I really want a similar beige color, but Premier Yarns has said this has been discontinued. Unfortunately they won’t be restocking that color. If I find a similar yarn in that color I will share! please help…. I can’t find the premier yarn couture jazz beige anywhere…. Any advice? I’ve keep checking premieryarns.com but no luck… ???? It is also now rated as a #7 Super Bulky Weight, not a #6, so people might not find it as easily. I looked under #6 and it wasn’t there and just by chance wanted to see what #7 looked like and found it. Just something you might want to mention to your followers. Well, it’s a little confusing, Premier Yarn has Couture Jazz listed under #7 “Jumbo” but when you click on it it classifies it as “Super Bulky Weight” which is what they call #6. Go figure. But they have lots of beautiful colors in stock, the price has gone up but it is well worth it. Can you use craft tee for the yarn? is there a reason you use this cast on instead of the quick cast method? It tends to be a sturdier way to cast on with arm knitting. The artist should be credited at the end and or in the description below my video. 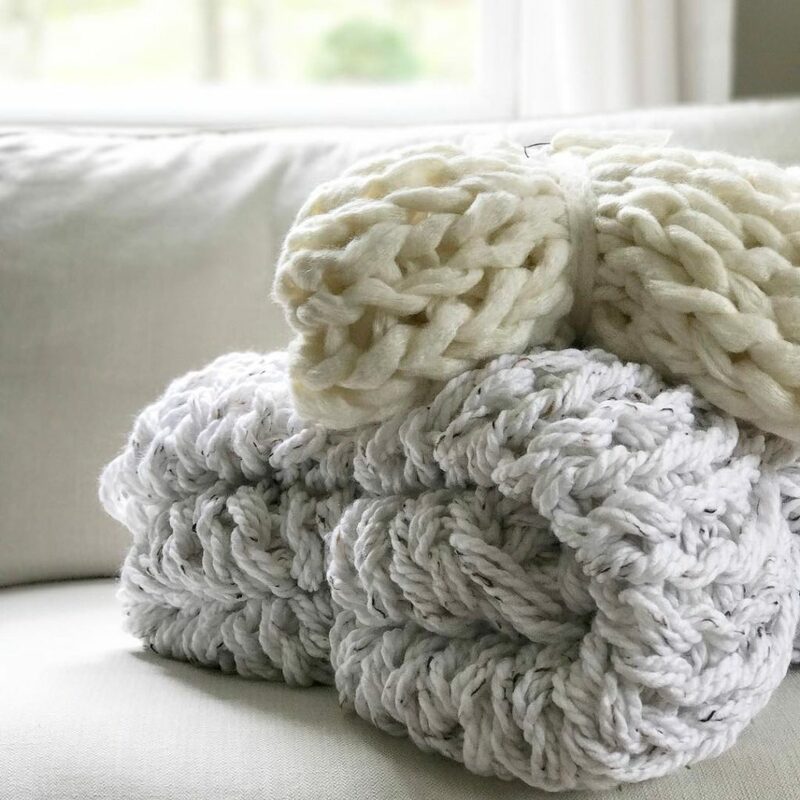 Hello:) I’m not sure if this has already been asked, but I was wondering how much yarn I would need if I was trying to make a blanket that fit on a twin size bed. It looks like your blanket went the width of a queen and I don’t want mine to be that big but I don’t really know anything about knitting so idk how much less yarn I would use. This blanket would fit a twin if you turn it length wise. Thanks so much for the tutorial. Your blanket looks fantastic! Just out of curiosity, does this yarn have a tendency to pill? It hasn’t pilled for me yet. I may over many washes and uses, though I only use it in the fall and spring and have only washed it once. How many rolls of worsted 4 yarn would it take to make the thickness of this one? I could not find Couture Jazz yarn in my area. However, I did find a yarn made by the same company and it was the same size yarn. But the balls of yarn were about twice the size as the ones in your video. If the yarn I get is twice the size of the one you use, should I buy half of the amount of yarn? Also what would you recommend if I wanted to make this blanket in two different colours? Sorry if this seems like a silly question. I’m new at this. P.s. : You are really talented! Hi all, how many balls or yarn do you need to use for this blanket? I want to make this, but the yarn in Cape Town (South Africa) Is really expensive, So i want to make sure I buy enough. Isn’t this a heavy cover….seems it would be very heavy? Second, I’ve tried arm knitting multiple times…I get the concept. Mine just always come out loose. I just purchased 8 skeins of “loops & threads chunky” yarn in white. Anyway, let me get to what I’m trying to say. I’m a bigger gal. Is that the reason why my blanket holes are coming out so big? Should I double up? No, your size has nothing to do with it (usually). The Loops and Threads Chunky is a lot thinner than the couture jazz, so the holes are naturally going to be larger. I have noticed that even though their yarn is classified as “6”, so is couture jazz’s. But CJ is so much bigger than L&T. You may need to order larger yarn, or find some large needles if you still want to use L&T. OR, yes, you can double up and use two skeins at once. I’m interested in this couture jazz yarn, but have no idea where in South Africa i can get hold of it.. any suggestions? I’m in Australia and finding it really hard to find a yarn chunky enough to make your blanket???????????????????????? PLEASE HELP ???? Hello! Can you find Red Hart Grande yarn? 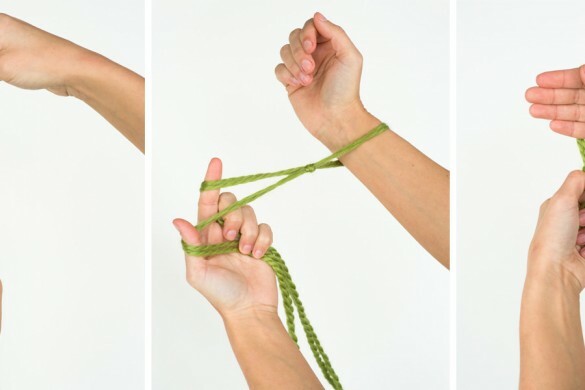 Try using 4 strands at a time if that yarn is available to you. hola maggie me encanto la manta que hiciste con los brazos, increible!!! !la voy a intentar realizarla.soy de buenos aires argentina espero tengas alguna persona conocida que hable espaniol para que te lo traduzca!!!!!!!!! !sos genial!!!!!! !muchas graciasssss!!!!! I am planning on making a few blankets with this method for Christmas. I found a different yarn than the kind your using and planning on using two skains at a time. Would this yarn have a similar look?? It’s called Nernst blanket yarn. Size 6. I have never knitted before but I thought I got the hang of the first step of casting on to your right arm. However when I went to start knitting on my other arm, I would tighten it and end up with a large loop in between my arms. I have two loops per stitch on my right arm but in your video it looks like you only have one. Is that the problem? What am I doing wrong? one stitch is one loop. I’m not sure I understand your question. Can’t wait to try this! I want to order the yarn but I’ve never done any knitting ever! How much do I order? The website asks how many. You said 11 skeins. So would I order 11 of the bundles from the website in your link? Thanks! 55.00 with the yarn on sale. why is everything a VIDEO? I cant carry a VIDEO around with me and refer to the instructions.WRITTEN,PLEASE! Purchase my book for written instructions. How does the courier jazz yarn hold up with washing and use? Does this look like it would work? BTW< thanks for the video. It was so helpful. Trying this arm king soon. Love your steps of teaching to knit. Thanks-Bunch! King Knitting Needles: the ARMS! Thank you for this easy tutorial! I’ve been wanting to try this for awhile. Several people wanted their blanket wider. Is it possible to put many more stitches on your arm? I would think you would end up with stretched stitches when you bend your arm of the stitches go up over your elbow. Also, have you added fringe to any of these blankets? Lastly, when you wash and dry does the blanket become tighter knit or does it stay loose? I’d love to see more patterns! Hi there. You wouldn’t be able to add stitches over your elbow. You can add a couple of extra stitches up to your elbow but then it gets too tight. I suggest knitting 2 blankets and stitching them together with matching yarn. Hi, I found your blog through Pinterest and loved the idea of the blanket. I am in the UK so used Tivoli Curve yarn which is similar to the one used. 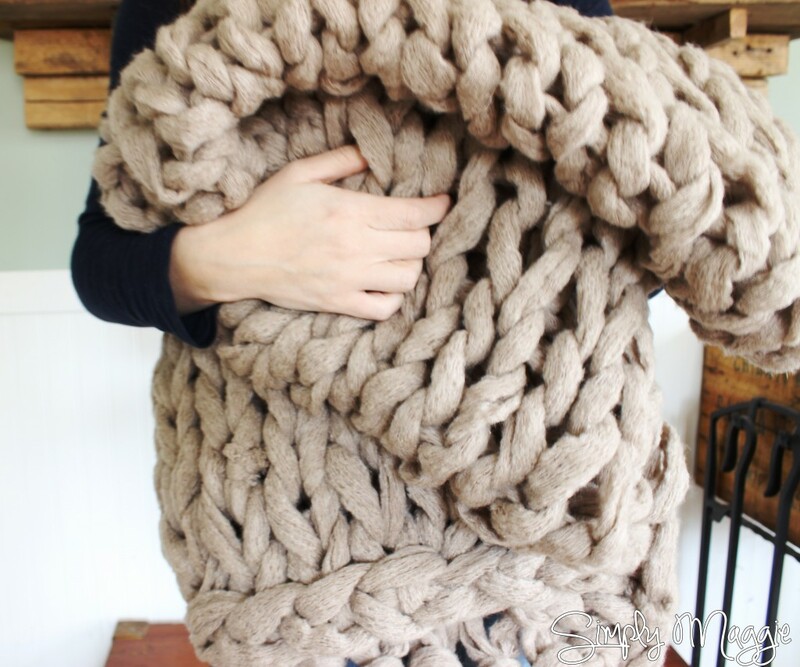 How many yards of I-cord would I need to make this blanket? Heck with pricey super-bulky yarn. 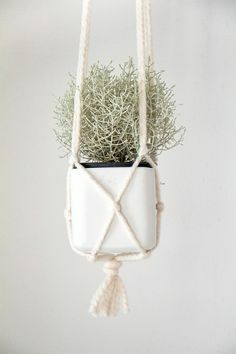 I’ll make my own with scrap yarn on a knitting spool! I am wanting to make a blanket like this but would rather buy the yarn in store. Michael’s doesn’t sell the yarn you used. Do you know of any other yarn that would work and turn out the same as yours? 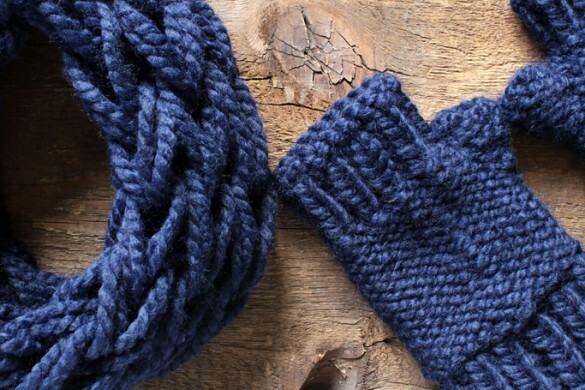 You can triple or quadruple up on super bulky strands of yarn. Unfortunately most stores don’t sell yarn as think as couture jazz. Maggie, thank you so much for the wonderful video on arm knitting the blanket. I am dying to make one now. I found the yarn online, but it’s pricier than I want to spend to start out with. I found a Patons Cobble yarn that seems comparable. Have you ever used this before? Thanks!! Does anyone know where else I can get it cheaper? I’ve tried amazon, beverlys, michaels, joann’s, premier yarn, lion head, and red heart. 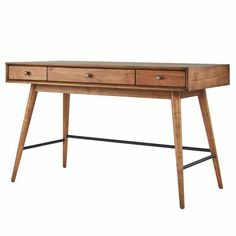 Hoping maybe I could find somehthing just as bulky and thick as the one in the video but no such luck yet. How many yards did you us? What yarns can i use that are cheaper? Where did you get your yarn from (what website)? Could i do stripes? Love the arm knit blanket!!! Quick question can this be done on a round tube? (In place of knitting needles) or (Arms) Like a plastic plumbers pipe so you can work at it for a few days…not connected to your arm. I have a grand baby that I would love to make one for! Could you please describe ie weight, name of the yarn needed for the blanket… Thank you. How many yards in total does one blanket need? im using the “Bernat blanket yarn” aprox 258 yards would one ball be enough? and should i double the strands? The largest needles you can find. Size 50 or larger. I was wanting to make a smaller blanket, like a baby blanket as a gift. Since you used 11 skeins, do you think 5-6 skeins would be a good amount for half that size of a blanket? maybe more of a square size… first timer so I want to get a better idea before I purchase the yarn. thank you! if anyone can answer thatd be really helpful it’s sort of time senseitive ! thank you! Hi there. Sorry for the delay. That yarn isn’t quite thick enough. The yarns that are thick enough are normally around 50.00 or more to make a blanket. My arms are too chunky and/or ‘curvy’ to get a tight stitch — the stitches were killing my and turning my arms red and I couldn’t even push them all the way up and it still turned out fairly loose. Would seriously using two large sticks/broom handles/whatever work? Where would you gat that yarn at? Anyone else having trouble? I have followed this 4 times. I can do the other arm stitches on Youtube. But the tail won’t follow the working yarn when I start knitting. After hearing the dog flap his ears 10 times, I can’t watch anymore. That’s the important part that shows how to start it and where I am getting it wrong. How much yard did it take you to make a blanket this size. I want to make one a bit larger but not sure how many yards to purchase. Hi Samantha, I used approximately 180 yards of Couture Jazz yarn. Hi Lauri. It will look just a tad less chunky and full but will certainly work. I’d purchase 9 skeins total. I so love this! We shared this on our blog and I am hoping to try it next week! Thank You for the inspiration!!! Thank You for making this tutorial!!! how about a shawl or wrap type garment. Love this blanket!! Was wondering if you could make me one??? In the beige colour. Please message me. Thanks. I sell some blankets on my etsy shop. Click shop on my website at the top. Hi Maggie. Do you have a tutorial on how to make cushion covers like this? I think they’d be super comfy! I understand he cast off. But when I am on my 2nd row transferring to my left hand, the yarn becomes very lose no matter how much I tighten it and when I am done transferring the last three stitches from my right to left hand it have a huge gap in between my right and left arm with excess yarn and becomes very loose I can’t even tighten it. What am I doing wrong? And why does it become loose like that? I crochet but this is my first time arm knitting and knitting. Your instructions are simple enough I thought I understood them but I don’t know what I am doing wrong. Hi, new to arm knitting and I was wondering how many balls of yarn you buy to make one blanket? 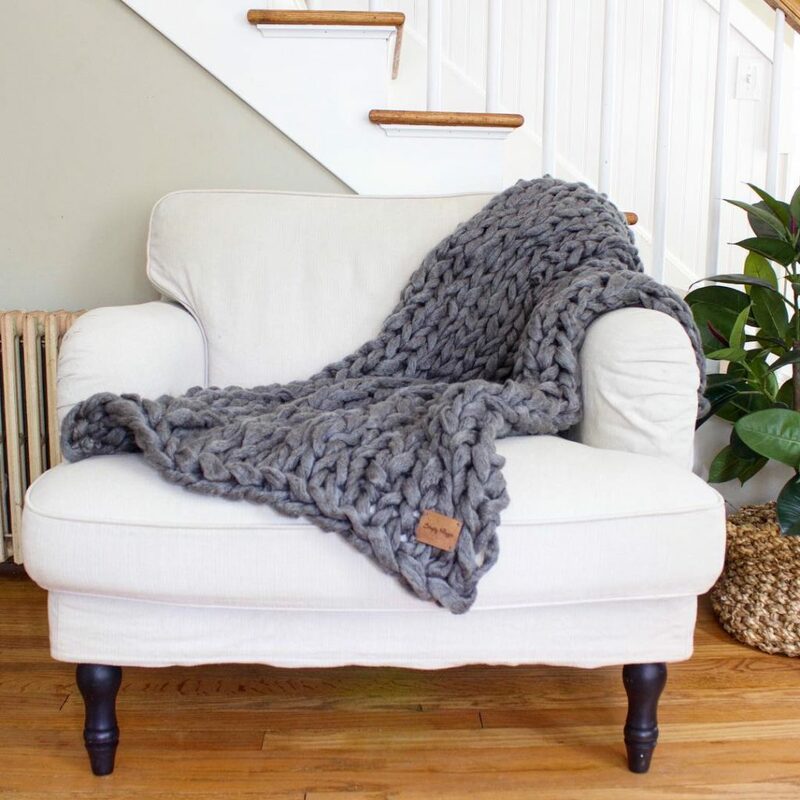 Hi There Maggie, I’ve been looking online and have yet to find an answer, how many skeins of the lion brand quickie would I need to make a queen size blanket or even a king size? Hey Maggie, thanks for the great tutorial. Always been a crocheter myself but, started working at Michaels’ craft store up here in Canada a few months ago. Heard about arm knitting from a co-worker but, just never got around to trying it. 3:30am is a good time for trying new things, I guess. Checked out several tutorials on YouTube but I couldn’t make sense of any of them. Saw yours and, bingo. We don’t have the brand you used but, our equivalent is called Ginormous. Also, I wanted a wider blanket so I did 30 stitches across. Might be a little too wide. I’ve pulled it apart and am going to try 24 instead. If 18 makes a 3′ blanket, basic math would suggest that, another 6 stitches would add another foot. (Pretty smart, eh?) Another thing, being a man, my arms are just a bit bigger than yours. I can’t make the stitches tight enough to keep down the size of the holes. I’m going to try doing two threads together. Whether two super bulky 6’s, or a 6 and a 5, I haven’t decided. I’ll let you know how it turns out. This might just start me knitting proper. Could never get the hang of it before. how many balls did u use for the yarn pls ?? Hi! I live in Australia and Premier Yarns doesn’t seem to ship internationally, what yarn should I look for? Or can you suggest and alternative? Thank you!! Hi Maggie. I know you put a link to the yarn on your site, but I can’t find it anywhere for as cheap as you got it. Do you know where to get it cheap or do you have your own promo code or anything? Thanks. I love how this table turned out! They grey was a perfect color choice for the chairs. It goes nicely with the table without feeling too matchy. Thanks for sharing! I am using red heart grande super bulky #6. I’m not sure how long my tail should be. I hv tried 10, 8,7. I get about 30 cast on stitches. And hv a ton of tail left. Please advise on tail length, cast on stitches and how many stitches I need to arm knit. Making a blanket. As well advise how many skeins I would need. I hv 4 now. Doubling up. Using 2 at a time. Thanks for advise. hey maggie! i live in Australia and iv been watching your tutorials for ages now and waiting for the chunky couture jazz yarn to be sold here but its been over a year now and I’m tired of waiting 🙁 did you have any idea of where i might be able to source it that will ship to Aus? or would you be able to send me some and i pay you? This is really a unique craft. Thank you for sharing this. I love this! If I wanted to make something 2 feet wide, do you think I should do 12 stitches wide, if 18 = about 3 feet? I finished my first blanket tonight. I only used 6 skeins and I got the same size blanket you made. I tried to make the stitches as tight as possibke in my arm but for a first try I think it turned out OK. Do you know where to buy the merino wool and how much is needed to make a similar size blanket? I think that might work better for me. How long would it take to make a twin blanket, and how many stitches should I do? Hi Maggie! 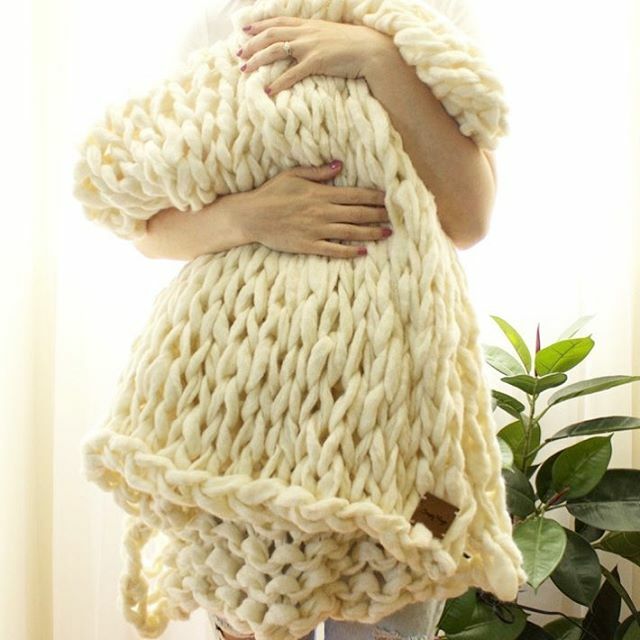 I was wondering what is the largest sized blanket you have ever arm knit? I have a queen bed that I would love to arm knit a throw blanket for but worried it might be impossible. Any advice? Thanks for your inspiration! Awesome tutorial – took me about an hour and a half – just because I was watching a football game while I worked though! I used Paton’s Cobbles which is also a “super bulky” but is not nearly the bulk of yours – should’ve doubled up my strands and I think it would have looked better – next time I suppose! Wow Maggie, You are really amazing. The blanket seems very comfortable.. So I have tried this several times but keep ending up with yarn that wont tighten up after the first row. I am using Bernat Mega Bulky as it was the largest and softest I could find at my local Joann’s store (they had nothing as big as yours). If you have any pointers I would be incredibly grateful! I have been wanting to arm knit a comfy blanket for so long! Thank you for the tutorial. After you cast on your stitches and you begin knitting your rows, the first stitch will be tricky to tighten. Make sure you pay close attention to how I tighten it in my video. If that’s not the issue, then maybe you’re twisting the stitches the wrong way? Could you give an estimation of how many yards of yarn were needed? I’ve purchased some Loops & Threads Gianormous (spelling?) to attempt my first arm knit throw. I want to make sure I have enough. Thanks in advance! Hi Cassie. I used approximately 180 yards for my 3′ x 5′ blanket. Hi I am using lions brand quickie and was wandering if I am suppose to remove the black string ? I have some severe medical issues and doing this this way might not work so well for me. Any suggestions? My daughter has been wanting one of these blankets and even if it takes my last breath, I will get one made for her in time for Christmas. I can’t believe all the false advertising, photos showing blankets that are made from a complete different yarn , blankest made & sold that are not what the photo shows. ( especially the cheap China WALMART & EBAY ones) Then the Price of the correct yarn, cost 200.00 to make it.Very Very few can afford to buy Merino wool at the price it is. J (just the rich)Then just because it super cool blanket that almost everybody would like to have, but the money hungry greedy manufacturers & retailers jack up the price so high only the rich can afford to buy it. You sure can tell that the world & so many people are going to Hell cause it sure won’t be tolerated in Heaven. Getting a rich man into Heaven will be like getting a camel threw the eye of a needle. Math: 9-24. Maybe some manufactures might read this & think twice? Well my piddly disability check will never cover that cost, so it’s angers me that I will never be able to make one. But I am going to come up with a better, cheaper Idea, since I have been yarning since I was %, so about 55 years, & the pattern or blanket itself will only be available to low income people. Hi there, if I use less skeins of yarn (9) what would the dimensions of the blanket be approximately? Thank you, thank you, thank you. I don’t generally knit, but have a friend’s birthday coming up and they LOVE blankies for cool nights watching TV or even sitting outdoors. I gave it a go and, even watching the video over and over at every step, I went from don’t know to done in about 2 hours. My tension will get better when I make the next one, I guess, but I am over the moon happy. PS I used Mondial Express (50/50 Merino wool and Acrylic. Handwash only.) and used 4 and a bit 200g skeins, 21 stitches and 20 rows (too loose) for about the same size as your blanket. Thanks again and again for your help.